This is the 30 mm Gatling cannon out of an A-10 Warthog. As you can see in this old Air Force photo-op, it's bigger than a Volkswagen. Hey Hanz, Do You Think It&apos;ll Fit? An early problem with this gun/plane combo was that the gun was so big that every time it was fired, its exhaust gasses would get sucked into the plane's two engines, causing them to flameout and stall. The plane's engineers' solution was to set the engines' igniters (like their spark plugs) to come on every time the gun was fired. 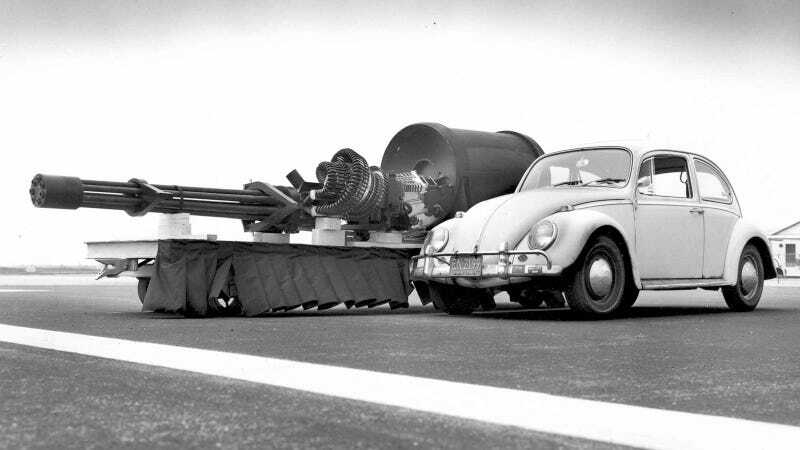 Now they just need to put the gun in the Volkswagen.